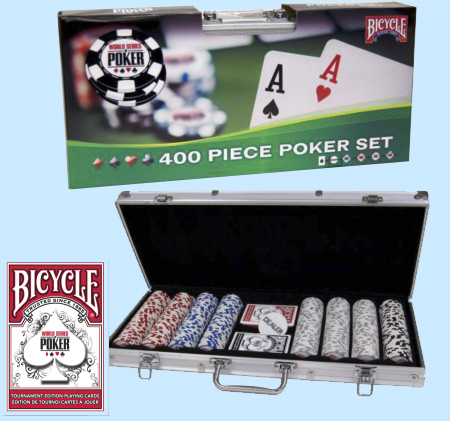 This World Series of Poker 400 Chip Poker Set contains unique, 11.5 Gram WSOP logo poker chips and two decks of WSOP Bicycle Playing Cards in a sturdy aluminum carry case. The set has 150 chips with white/grey edge spots, 100 chips with red/white edge spots, 100 chips with blue/white edge spots, and 50 chips with black/white edge spots. Sale - $36.22. Was $59.00. Save 39%!